It’s the beginning of another cold year for us here in Michigan, and we at King Brothers Collision would love to greet everyone a very Happy New Year. Thank you for always supporting us! We promise to keep giving you the best in automobile service for your buck. With that said, let’s get to this month’s article topic: a checklist for your car to prepare for the cold weather. If it’s been a while since you got your car serviced, now might be a good time to bring it over to Kings Brothers Collision and give it a good once over. Our expert mechanics can tell you what’s wrong with your vehicle from a mile away. They’ll diagnose your car and give you a proper, honest prognosis, we can guarantee that. 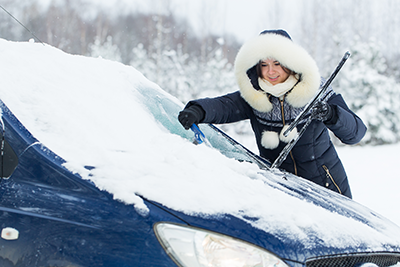 Avoid having to jump-start your car in the cold weather. Starting problems is a common thing and batteries should be the first on our list of must-does. During cold weather, batteries often always get a work-out and get hit by the brunt end of the cold stick. Decreased output is a sign that you might need to have your batteries replaced soon. You will need to maintain a 50/50 split of water and coolant to ensure the best performance. Coolants can get contaminated with foreign substances or can get over-diluted by having an uneven mix. Be sure to check your coolant before winter sets in, and have it replaced at King Brothers if you need to. Do the penny test for an easy-way to know if your car’s tires are cold weather-ready. Stick the penny in one of the tire’s grooves with Lincoln’s head pointing downwards. If his head is still visible, you might need to have your tires replaced. You don’t want to lose traction while driving on the snow and ice and risk a potential car crash or accident. Make sure your tire pressure is maintained to the standard as cold weather tends to deflate tires. Winter tires should also be considered. Driving in the snow is a real hassle. Visibility is shot with your windshield covered in snow, ice, salt, and mud. Be sure you have enough wiper fluids and your wiper blades can still wipe. Consider replacing them with heavy-duty types for a more effective wiping aptitude. Visibility should be a top priority for yourself and other motorists’ safety. Make sure all your lights are working from your head, tail, turn, and hazard lights. If any of your lights are malfunctioning, there might be a problem with the electrical wiring. Take your car over to have your lights looked over for any malfunctions and possible replacements. You should be replacing your oil every so often, but most especially during the cold season because oil gets thicker and reduces in its ability to circulate through the engine. Thinner oil might be an option but it’s always best to consult your owner’s manual, or better yet, an expert mechanic. How do you know if your brakes aren’t working? Maybe you shouldn’t find out the hard way. Don’t be cheap for your safety. Be sure your brakes still have enough grip and if not, have them replaced. You never know what’s going to happen out there. Because of that, you need to be prepared for any curveballs thrown your way. Have a kit handy for any emergency. Included in it should be: blankets, flares, a jack, a first-aid kit, a flashlight, a shovel, food, water, and kitty litter or sand for traction. Cold weather is a common, everyday occurrence, especially for us over here at Michigan. When driving out in the cold, we should always prioritize our and other motorists and pedestrians’ safety. Hopefully, this checklist will provide to be a good guide for you. Kings Brothers Collision will always be available to service your car. Just bring them over and we’ll make sure everything is in its proper order. We at King Brothers Collisions, take pride in being able to find whatever vehicular problems you may encounter from cracked windshields, oil changes, or exterior paint detailing. Whatever that may be, give us a call at 13-534-8090 (Redford) or 734-744-8557 (Livonia). You can also fill out our online contact form and we’ll get back to you at a more convenient time.